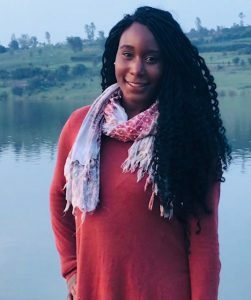 Niesha Ford is a proud native of Hayward, California, and graduated from College of Saint Benedict/Saint John’s University where she earned a Bachelor of Arts in Biochemistry. Throughout college, Niesha was eager to be active in service, domestically and abroad. She spent the summer of her freshman year volunteering at a free clinic and co-led 30 students on a service trip to Peru in her senior year. Niesha was an INROADS Scholar in 2014/2015 and a Mayo Clinic Innovation Scholar in 2016. She gained public health experience at the clinical and policy level through internships with Kaiser Permanente, Mayo Clinic and CentraCare Health. Following her passion for service and public health, she joined the Peace Corps as a Maternal and Child Health Volunteer. In Rwanda, Niesha implemented various programs to improve maternal and child health such as kitchen gardens, latrine construction, and malaria education. Alongside these duties, Niesha devoted time to teach English and created a youth leadership and empowerment club. Niesha is thrilled to begin a career with USAID as a Foreign Service Officer. She will pursue a master’s degree in public health with a concentration on infectious disease. Niesha speaks conversational Spanish and Kinyarwanda and is currently studying French. In her spare time, she loves to read, watch documentaries, and be adventurous.